I came across some old pictures while preparing to upgrade my computer and found a bunch from the neat things we saw while geocaching. A few years back we went on a two day road trip with a friend so we could get the counties and grids we need for the PA Delorme Challenge and the county challenge which we sadly still haven’t finished but that’s another story for another day. 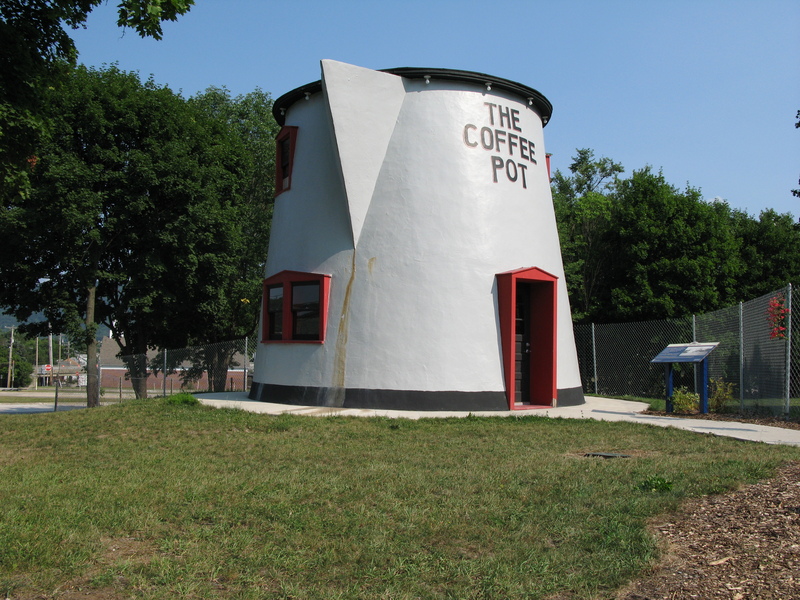 We saw some neat things out there but this post will be about the giant coffee pot shaped building near Bedford. Back in when people first started getting cars they started traveling more so people would build stuff to get them to stop. It makes you wonder what the Lincoln highway must have been like a century ago when people could realistically start traveling. That was the way to go then as there were no highways like we have now. Cars were probably too unreliable to consider highways anyways. I would have loved to have been able to check out what the inside of the building looked like. Either way I’m grateful the cache was allowed to be placed here otherwise we may have been passing right by the area on the turnpike because it’d be faster. I’d like to explore the Bedford are more someday.